It's not all parsnip-peeling and gravy-making - this is also a month for a bit of kitchen frivolity, so let your creativity loose with this delicious Christmas biscuits recipe. Preheat the oven to 180°C/gas 4. Pulse the flour and butter in a food processor until the mixture resembles breadcrumbs. Add the sugar and spices, then pulse again. Tip into a bowl and add the egg, stirring until a dough comes together. Knead gently till smooth. Tip onto a lightly floured work surface and roll to the thickness of a £1 coin – about 3–4mm. Cut into stars with a cutter. Lift the stars carefully with a palette knife and place, spacing them evenly, on baking sheets lined with baking parchment. 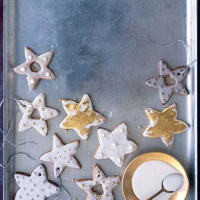 (To create a glassy centre in the biscuits, cut out a shape in the centre of half of the stars and fill with a clear boiled sweet.) Make a hole in the top of each biscuit with a chopstick. Bake for 10–12 minutes till golden. Push the chopstick back into each of the holes while the biscuits are still soft. Leave to cool for 2 minutes on the baking sheets, then transfer to a wire rack. When cool, you can decorate the biscuits with a simple icing made from icing sugar and water; add balls or colour, and thread with ribbon to hang on the tree.